If you're willing to give up some cutting speed to gain cordless convenience, you'll find that the Fein Multimaster Cordless clearly has Fein DNA all the way to the core. We recently wrapped up our sweet, new Oscillating Tool Shootout for 2018. With 26 models on our plate, we had our work cut out for us. In our series of reviews on each model, the Fein MultiMaster Cordless is due up at the plate. The cordless version of Fein’s Multimaster comes in with pretty high expectations. After all, Fein pretty well owns the oscillating multi-tool category. So what happens when you swap the cord for a battery? 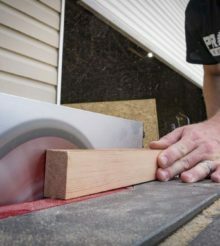 Oscillating tools aren’t the most feature-rich tools out there and there are only a couple of major things we look for. You’ll find a standard power switch and variable speed dial on the cordless Multimaster. What you won’t find is an LED light. Some people want, others don’t feel like it’s necessary. Regardless, it’s not a common feature on corded models, but it is on most of the cordless ones. The Fein Multimaster Cordless comes with a pair of 2.5 Ah batteries. While the SuperCut Cordless comes with 5.2 Ah packs, these smaller batteries will help keep the weight down while giving you enough runtime to tackle those cuts and scrapes that only a multi-tool can handle. The StarlockPlus mounting system enables quick and easy, tool-free blade changes. As a matter of fact, you don’t even really need to touch a hot blade. Simply pull the Starlock Lever on the top of the Fein Cordless MultiMaster, and the old blade pops off of the mounting. Then, with the new blade sitting on top of a surface, just press the MultiMaster down onto the blade. The new blade clicks into place, and all you need to do is pull the lever back to lock it all down. The StarlockPlus Mounting system is, far and away, the best blade lock system in play today. However, the only products you’ll find it on are from Bosch and Fein, as they co-developed this proprietary system. Handle design and weight play heavily in how we rate these tools on their ergonomics. Most oscillating tools still use a larger diameter grip similar to a grinder body. I generally prefer the ones with a slimmer rat tail grinder body style, but there are some trade-offs in vibration. The Fein MultiMaster Cordless uses the more old-school approach to handle design. It has the on/off switch and the larger diameter handle. It also weighs in at 3.83 lbs with the battery attached. None of this presents too much of a problem, but note that there are lighter options available. Things start to go a little sideways for the Fein MultiMaster Cordless when we look at cutting speed. It averaged a cutting speed of 43.6 seconds through 2x pine. This is roughly double what most of the other oscillating tools were doing, and even a greater gap to the high-speed cutters. The point here is that the cordless MultiMaster cuts slow for a product with its pedigree. It’s not all cloudy skies for Fein, though. While this tool cuts slowly compared to the rest of the group, at least you won’t really feel it. The vibration control on all the Fein models we tested works exceptionally well and this model proves that Fein has this area of performance down pat. Another area where the Fein MultiMaster Cordless excels revolves around noise levels that it generates. We measured this tool at 94 dB(A) at an arm’s length away. Only one model operates more quietly [92 dB(A)], and most of the models we tested sound off between 99-104 dB. The differences here might sound negligible, but remember that sound pressure level doubles every 3 decibels. All this is to say that, the loudest model we tested has more than 8x the SPL level of the cordless MultiMaster. Price is not the sole determining factor that we take into account when we come up with our value rankings – it’s what you get for the price you pay. The Fein Multimaster Cordless takes a hit in its value ranking thanks to its $339 price tag and performance that didn’t keep up. What saves it is that it does other things well like controlling noise and vibration along with taking advantage of Starlock. If you’re willing to give up some cutting speed to gain cordless convenience, you’ll find that the Fein Multimaster Cordless clearly has Fein DNA all the way to the core. It’s a comfortable oscillating tool to use, though you’ll pay more for this premium tool. I got one..so far it’s a life saver. .thumbs up..